Newport resident and skilled photographer Chris Riou has donated her photo of the Spotted Pardalote for the newly designed PEF logo. If you found this or other articles of interest or were inspired to be more environmentally active, please consider a donation or become a Become a Friend of the Pittwater Environmental Foundation. Feather-tailed glider sightings in Pittwater are becoming more common with recent reports from Church Point and Rocky Point on the Western Foreshores. To assist nesting glider nesting boxes have been installed at the PEF’s Bothams Beach site where they are undertaking bush regeneration of a small Spotted Gum forest foreshore. Someone loves the old Union holiday camp on the western shores of Upper Pittwater; however, the PEF is still waiting for a Plan of Management to be finalised by State Government before they can start to use the $1.37 m donation from a private donor last year. The gift is to be used for the environment, heritage values, public amenities and the historic homestead Midholme, with an oversighting role to be played by the Friends of Currawong. 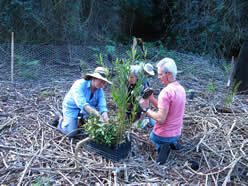 A Community Planting Day was held at the Irrawong waterfall site on Saturday 21 September. The Mullet Creek project is now in its second year of funding from the NSW Environmental Trust. The project will run for 6 years. The rare Giant Burrowing Frog has been found In Upper Mullet Creek during a nocturnal survey commissioned by the Pittwater Environmental Foundation. Last sighted in 1994, the Giant Burrowing Frog, Heleioporus australiacus, is listed as vulnerable under both the state and federal Conservation Acts.